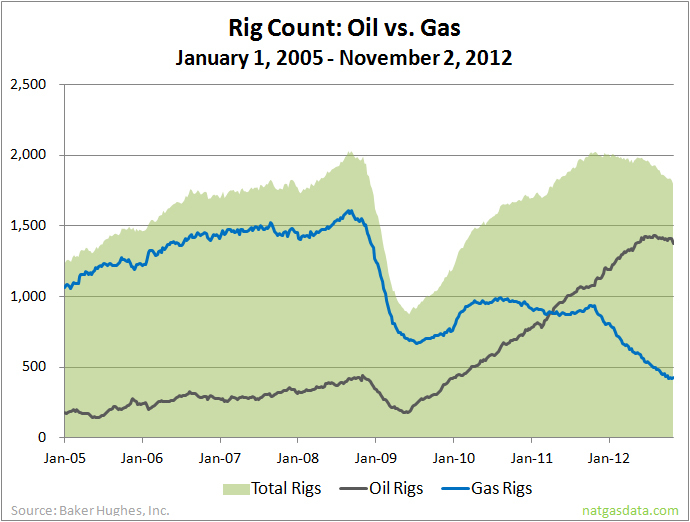 The Baker Hughes rig count dropped by 26 rigs this week to 1,800. Oil rigs were down 35 to 1,373 (lowest level since 5/11/12), gas rigs were up eight to 424 and miscellaneous rigs were up one to three. By type, horizontal rigs were unchanged at 1,105, vertical rigs were down 12 to 500 and directional rigs were down 14 to 195. Among gas rigs, horizontal rigs were up eight to 283, directional rigs were down one to 72 and vertical rigs were up one to 69.